In this page adding fractions worksheets you can get 5 worksheets on adding two fractions with common denominators. This will refresh your knowledge in fractions. If we want to any two fractions first we have to consider the denominator of the two fractions. If the denominator of two fractions is same then we can put only one denominator and we can add the numerators. But the denominators are not same then we have to take L.C.M for making them same. After that we can put only one denominator and we can add the numerators. Before attempting question let us see the simple problems to understand this topic much better. 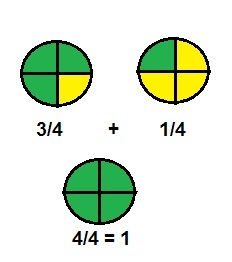 Example of adding two fractions with common denominator. We are having the same denominator. So we can put only one denominator and we can add the numerators. The denominator of the second fraction is 2.To make them as 8 we have multiplied the second fraction by 4/4. Now we have to common denominator. So we can put only one denominator and add the numerators. Now you can find 5 set of question papers which involve adding two fractions. This question paper will help you to refresh your knowledge. Students who are in grade 4th and 5th can try this to improve their knowledge of adding fractions. Students can try to solve the problems in the worksheets given below in the same method we discussed in 'Adding like fractions' and 'Adding unlike fractions'. If you have any doubt, you can contact us through mail, we will help you to clear all doubts. Parents and teachers can encourage the students to do the problems on their own, so that they can master in adding fractions. After having gone through the stuff given above, we hope that the students would have understood "Adding fractions worksheets"
Apart from the stuff given above, if you want to know more about "Adding fractions worksheets", please click here.